The MF-100 is a compact and efficient feeding system that enables you to optimize the productivity of the moulding operation. With the MF-100, the operator can keep up with feeding the moulder end-to-end with spare time on hand to perform other functions. The MF-100 is a compact and efficient feeding system that enables you to optimize the productivity of the moulding operation. With the MF-100, the operator can keep up with feeding the moulder end-to-end with spare time on hand to perform other functions. By teaming up the MF-100 with a MR Return Conveyor for Moulder, you obtain a self contained work-cell where one operator stages blanks, handles returned mouldings and controls quality. Suitable for applications with a feed rate up to 100 feet per minute. Built on a standalone table positioned in the continuation of the moulder's feed table, the MF-100 Modular Feeding System features two hydraulically powered feed wheels on the moulder's fence side, two pneumatically actuated idler wheels facing the powered wheels above, vertical brackets designed to hold a stack of parts and a front gate designed to allow only the bottom part to feed forward. The basic lumber support table is 36" long, it is extendable to suit your application. The first powered feed wheel is positioned outside the hopper zone, closer to the moulder. It maintains the forward pressure and closes the gap every time a new piece is engaged. The second powered feed wheel is positioned immediately inside the hopper area on the feeder's table. 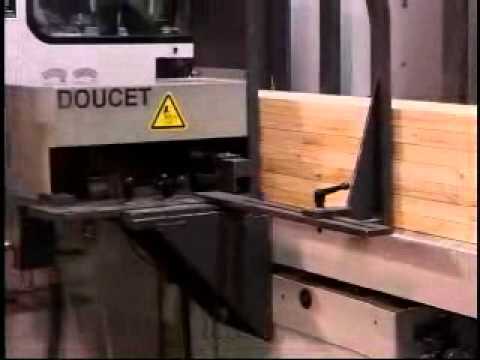 The operating sequence, controlled by PLC, allows for momentary release of the squeezing pressure between the second powered and idler wheels, allowing new boards to come into feed position. 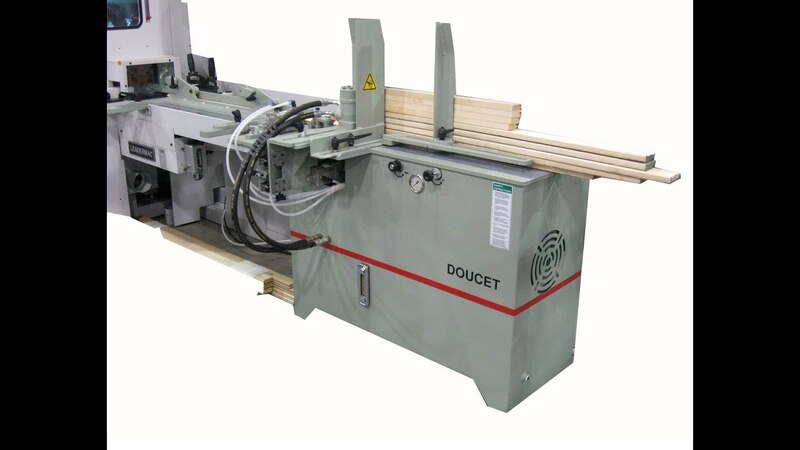 Lumber thickness: ¾" to 2"
Lumber width: 1 ½" to 9"
An optional guiding tunnel (top and side) can be added to the moulder infeed table. The addition of such a tunnel is needed when feeding blanks are shorter than the distance between the MF-100's outer wheels and the moulder's first set of feed wheels. In heavier load applications the second idler wheel can be replaced by a third hydraulically motorized feed wheel. It is available for 220 or 440 or 600 volts, 3 phases, 60 cycles electrical service.